Scourge of the Avon Ladies! 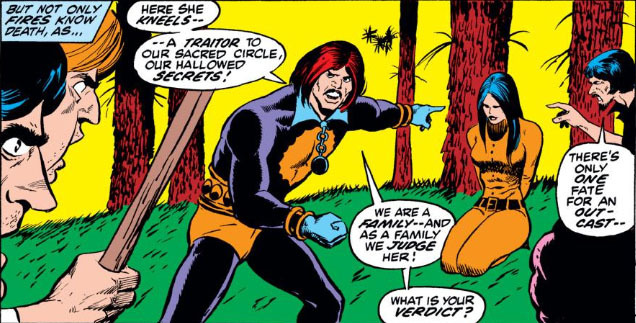 Prison seemed to work wonders for the Swordsman, who appeared to think things over after his team-ups with Power Man and Batroc's Brigade and arrive at the decision that working with partners wasn't working out for him. So what a pleasure it was to see him return, if briefly, to his confident and arrogant self, and go after the Avengers with no backup--taking on the whole team in order to abduct Goliath, not only getting away with such a bold act but pretty much making fools of the Assemblers in the process. Nice going, Swordsman. Those guys would be lucky to have you. Good grief--it's a virtual Masters of Evil here. The Swordsman has joined the ranks of the Lethal Legion--and the team is conducting separate strikes against the Avengers in order to capture its members in accordance with the Grim Reaper's crazed plan for revenge. Though helping to keep his evil cohorts in line is the Reaper's promise to grant the richest reward to the, er, Legionnaire who captures the most Avengers--and for the Swordsman, money speaks with a very convincing voice, indeed. 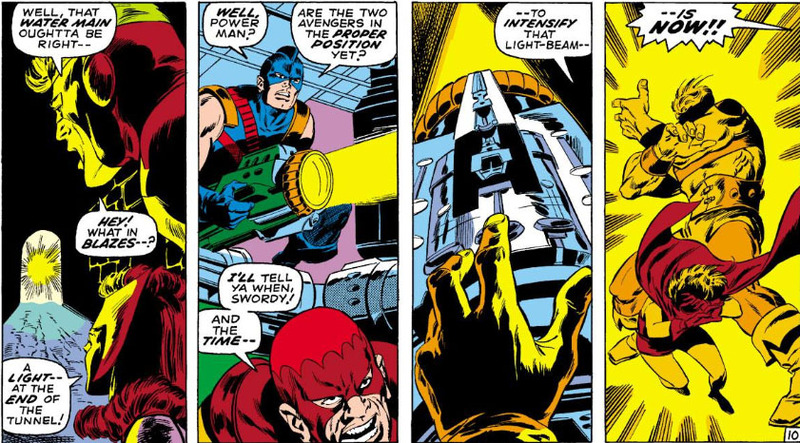 To that end, Power Man and the Swordsman--once more, partners in crime--are dispatched to the water main beneath Avengers Mansion, where Goliath and the Scarlet Witch are headed thanks to leaked information of the Reaper's plans. 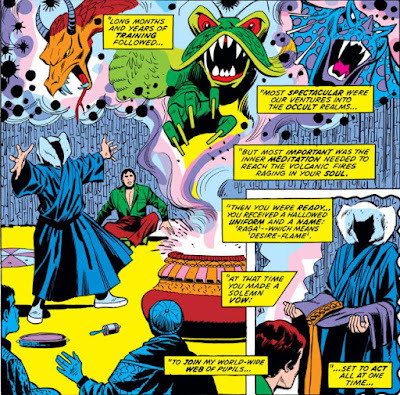 But their foes have prepared a little surprise for them, one that will make these Avengers less capable of resisting their attack. "A light--at the end of the tunnel!" Cute. 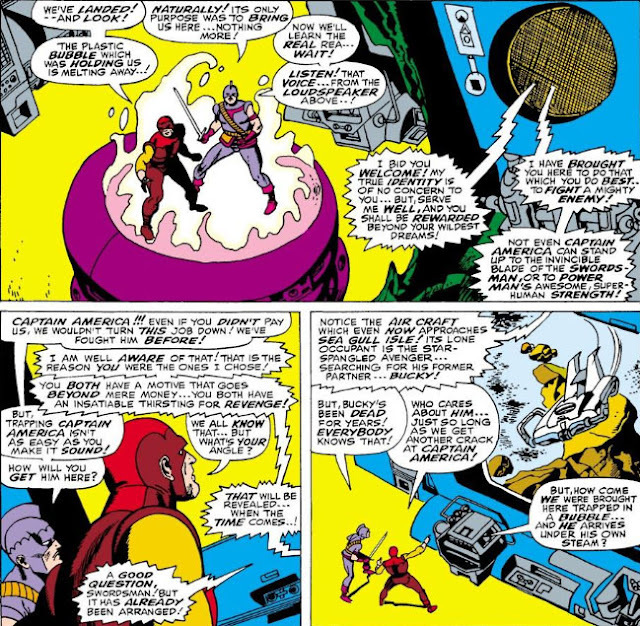 When you think about it, the Scarlet Witch--who used to invoke her power by simple gesturing--could have possibly hexed the eyesight of their foes, thereby evening the odds. As it is, the flailing Goliath is going to make it possible for the Swordsman to end this fight much sooner than anyone was expecting. 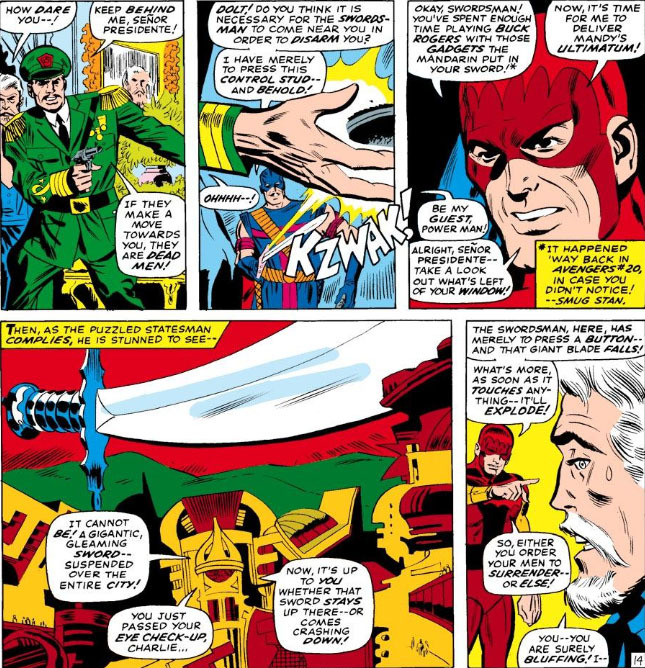 When the Avengers finally confront the Legion in force, the Swordsman shatters his blade against the Vision's diamond-hard form, and joins the rest of his comrades in defeat. But once he serves more prison time (where by now his fellow inmates are probably mocking him with tossed confetti to mark his return), he'll forge ahead to take his first steps toward rejoining the ranks of the Avengers. 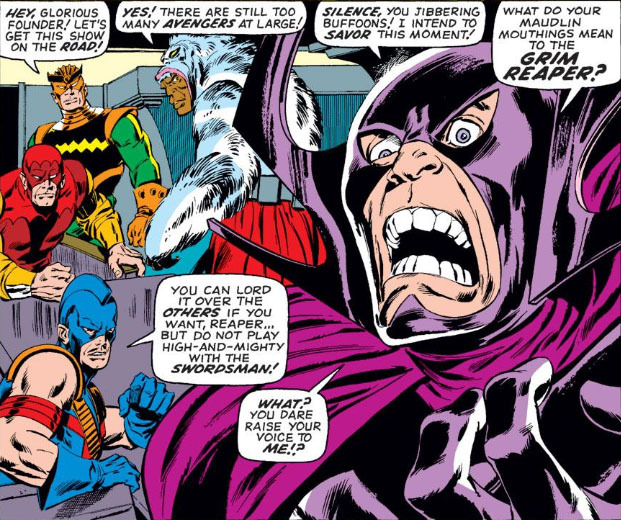 Swordsman Week wraps up, when the Avengers assemble--all of them! But does that include the man who left their ranks in disgrace? One heck of a list of supplemental reading! "Nobody is unbeatable! ...Especially you!" 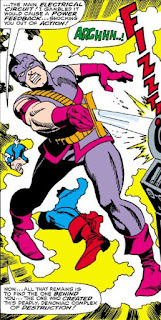 Batroc has been hired to retrieve a new weapon hidden by an enemy agent within New York--a "seismo-bomb" of immense power, capable of wiping out the entire city. All government intelligence knows is that the weapon is in the process of charging, and will initiate three small but powerful seismic shockwaves before a deadly, devastating fourth shock is released. Captain America is tapped to locate and neutralize the bomb, conducting his search where the agent was captured by S.H.I.E.L.D. Writer Stan Lee cuts to the chase with dizzying speed in this story, failing to make clear why S.H.I.E.L.D. isn't taking the lead on this case in light of the fact that they've been handling this operation since the beginning; a lot of field agents, which likely would include bomb experts, can probably produce results much faster than one man, even if that man is Captain America. 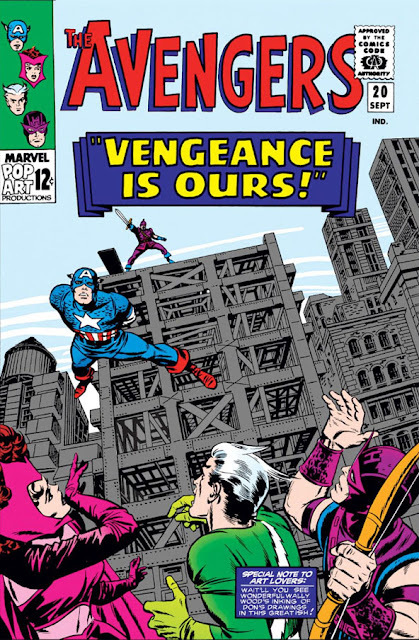 Regardless, the search is on, and Cap discovers that others are aware of the bomb's existence and seek to lay claim to it for their own purposes. 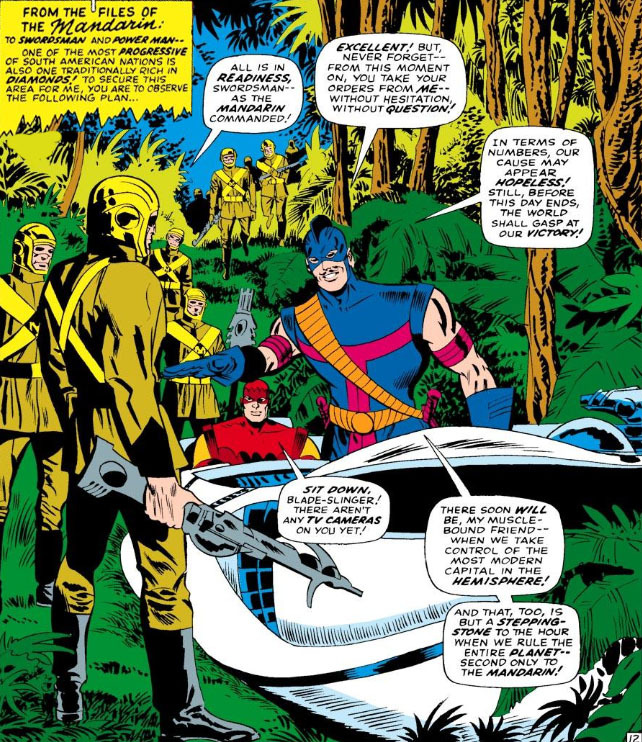 As we can see, the Living Laser rounds out Batroc's group, which, when factoring in the skills of both Batroc and the Swordsman, make this first incarnation of the Brigade a formidable teaming. But it's the Swordsman who's been tapped to hold off Cap while the others search for the bomb--and thanks to artist Jack Kirby's artwork which excels at hand-to-hand combat, we get a Swordsman/Cap fight to rival their first. 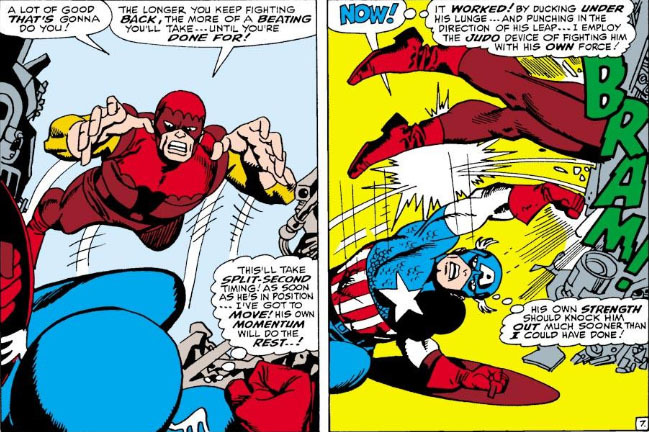 By now the Swordsman is well aware of Cap's fighting ability and tactical savvy, which is probably why he often welcomes the opportunity to engage with him again. And as the Swordsman has usually had difficulty making headway against Cap as long as the Avenger carries his shield, he has the foresight to disarm him, as he's done before. 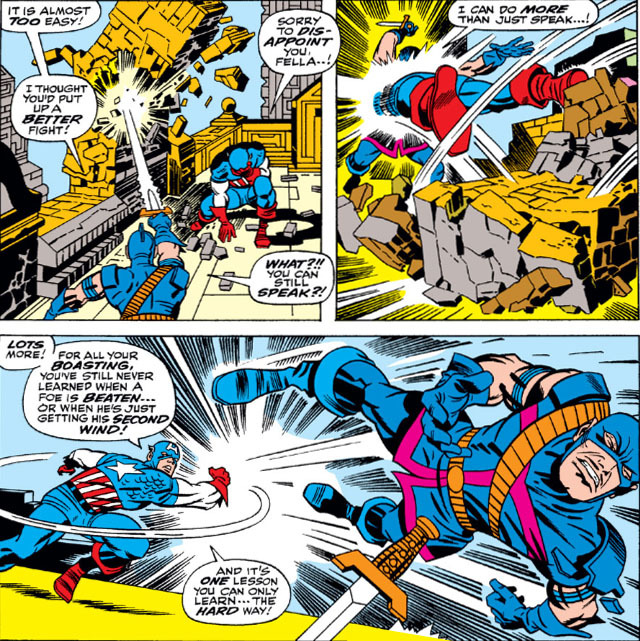 The result is a struggle which allows the Swordsman to meet Cap fighter-to-fighter--though with the Swordsman increasingly resorting to the technology that's been added to his sword by the Mandarin, their fight resonates only with echoes of that original battle where they were more evenly matched. Frankly, with the skillful and brutal assault the Swordsman has offered, it's difficult to see what's keeping Cap on his feet; a barrage of bricks is no less battering than the crates he was pummeled with that took him out of action in that warehouse fight. But with a city's fate in the balance, Lee knows the dramatic value of having Cap strive on; and so the Swordsman's rematch with his old foe is concluded sooner than it otherwise might be. 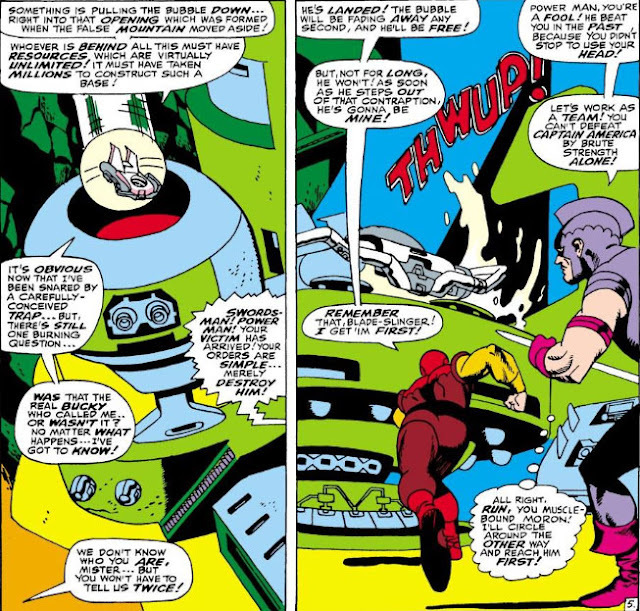 The seismo-bomb, if you're curious, was found barely in time, with Batroc seeing reason and joining forces with Cap to locate it. Aside from the fact that the seismo-bomb has no mind-damaging properties, it may remind you of Kirby's "madbomb," a similar concept which featured three powerful devices which emitted force waves affecting successively larger areas. As for the Swordsman, it looks like the man is about to face another prison term. Either his sentencing judge owes him a few favors--or he has one resourceful lawyer on retainer! The Swordsman's invasion of Avengers Mansion! Should auld acquaintance be forgot? The Lethal Legion--and the return of Power Man! You've landed in the middle of Swordsman Week here at the PPC! But we have a problem: With the Swordsman at long last in the custody of law enforcement (following his capture by the Avengers after teaming up with the Black Widow and Power Man to take them out), and presumably now tucked away in a nice prison cell, we're stuck here cooling our heels unless the man is paroled--which doesn't seem likely, since his sentencing probably took into account a criminal record that's as long as Mr. Fantastic's arm. In other words, we appear to have no Swordsman for the rest of Swordsman Week. (a) He has a really good lawyer, though to whittle down the Swordsman's sentence might take more time than the Swordsman has money to retain his lawyer's services. In any case, when all was said and done, the Swordsman might be out in ten years, which is still too long. 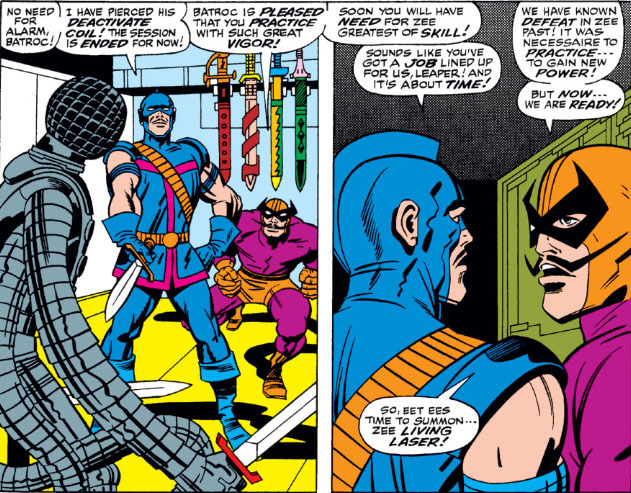 We'd have to move on to something like "Batroc Week." (b) He's instead extradited to whatever country wants his head on a platter. In which case it would be a very long time before he'd turn up again--alive, that is. (c) He's (presumably) broken out of prison by an A-list villain who needs both the Swordsman and Power Man as part of his Master Plan™ involving Captain America. Given our choices, what do you say we go with Option (c)? This would be the second in a string of stories featuring the Swordsman where it's been decided to team him with other recognizable villains, a fate which seems to be the case with characters who haven't yet been put out to pasture but whose solo appearances have tapered off. And while being a hired gun might make sense for the Swordsman--a fortune hunter who signs on for the short term and relishes a challenge--he seems ill-suited to the role of simply being pointed in the direction of a foe and told to attack. One of the strengths of the Swordsman's character, even as a disreputable character, is the virtual guiding principle he practically lives by: What's in it for him? Here, neither he nor Power Man knows the identity of their employer, or their plans--the two only know they're being paid a fortune to attack Captain America. To a careful man like the Swordsman, that should carry the strong smell of a set-up; yet he falls right in line with Power Man, and off they charge. 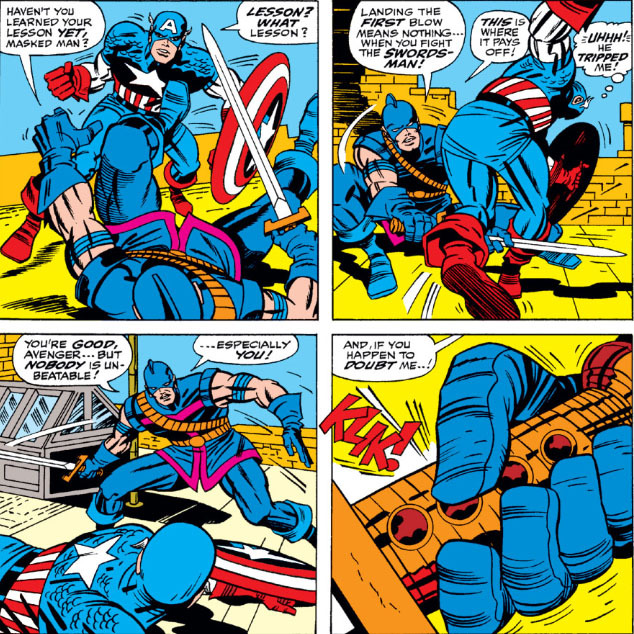 Cap arrives fighting mad, lured to this location by what seemed to be an authentic distress call from his deceased partner, Bucky--though Cap has usually followed through in such instances in the hope that Bucky has somehow survived. 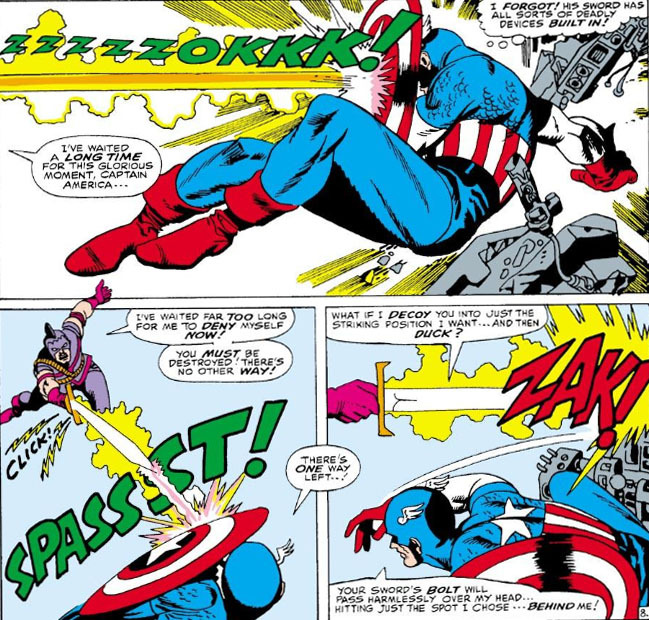 (Pavlov might have a few words for him, given all the times a taunting foe has dangled a Bucky-shaped carrot in front of Cap and he's responded so predictably.) Given his state, we'd expect him to regard the Swordsman and Power Man as nuisances, and writer Stan Lee doesn't disappoint in that regard. The mastermind here is eventually revealed to be the Red Skull, with the Swordsman and Power Man being used as catspaws in his scheme against Cap. The Skull had no real use for these two beyond antagonizing Cap, transporting them off the isle once their purpose was served (and probably stiffing them on their fee). Being so toyed with would normally be something the Swordsman would be furious about--but he has only himself to blame (and Lee, his original writer) for letting things even reach that point. The Swordsman we know from his introduction would have demanded that their mysterious host show himself and then explain his plans before any agreement was reached; instead, he was satisfied with a few flattering words and the promise of facing Captain America. The Swordsman may bristle at the Living Laser's insult--but the bladesman has made his bed by this point, so he should probably get used to lying in it. Still, the Mandarin is playing for high stakes this time, in a series of worldwide strikes which should have the entire planet falling into his grasp. Whatever the state of the Swordsman's pride, he appears to have seen to it that he's fully informed as to the nature of the Mandarin's plans as well as his role in carrying them out--and, combined with the chances of success as well as the scope of it all, it's not surprising that he's on board with the job he and Power Man have been tasked with. 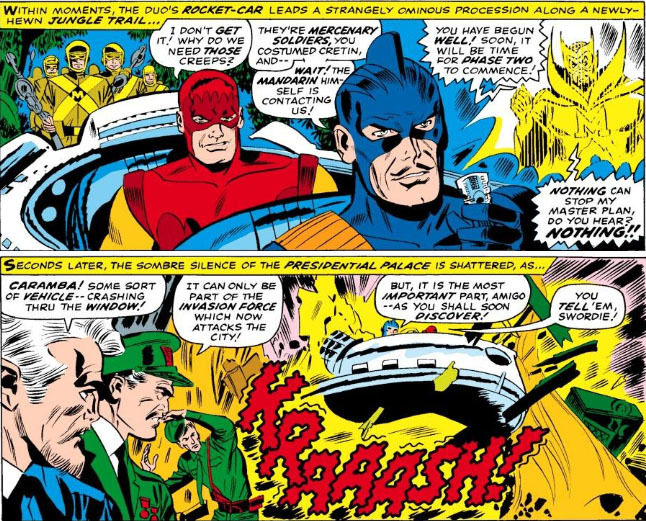 Unfortunately, the Avengers have also combined forces and headed off as sub-teams to avert these strikes. 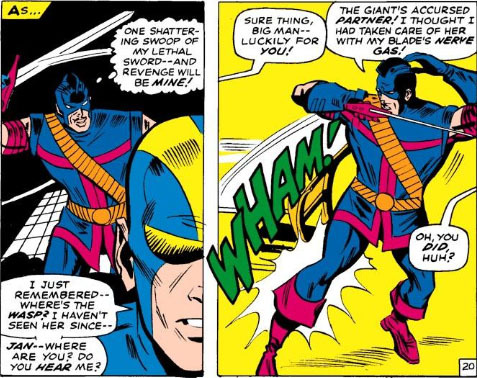 And while Goliath and Power Man hammer away at each other, the Wasp attempts to relieve the Swordsman of the triggering device for the deadly hovering sword. With the control device again in hand, the Swordsman would appear to be back in control of the situation. But what follows makes it evident how the character has changed. 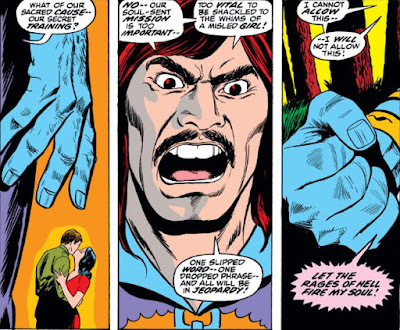 Where the Swordsman of old might have compelled the Avengers' surrender, the character here virtually twirls his villain mustache in deciding to destroy the city out of retaliation, even though it would likely sacrifice the foothold they've gained for the Mandarin. Fortunately, Iron Man was waiting in the wings to prevent the sword's descent (barely!) and neutralize its threat. Yet the act proves to be a near-fatal distraction to Goliath where the Swordsman is concerned. 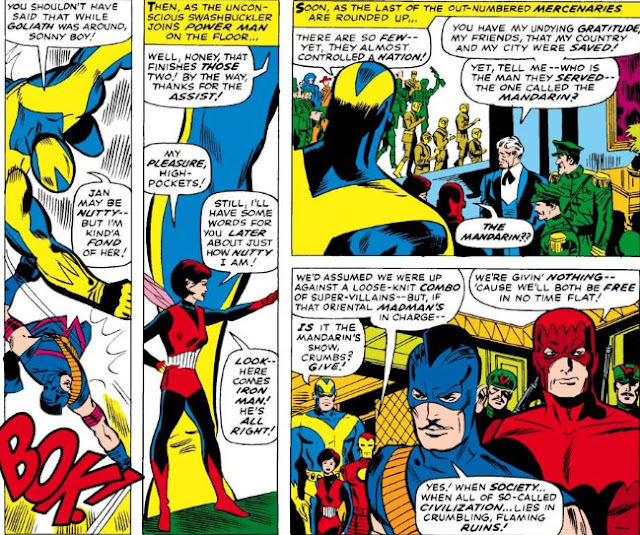 Fortunately, the Avengers went on to foil the Mandarin--so it looks like it's back to prison for the Swordsman (and Power Man), and perhaps it's just as well. If his parting words are any indication, the Swordsman has now been turned into a villain who delights in end-of-the-world scenarios. Is there anything of this once-strong character left to salvage? 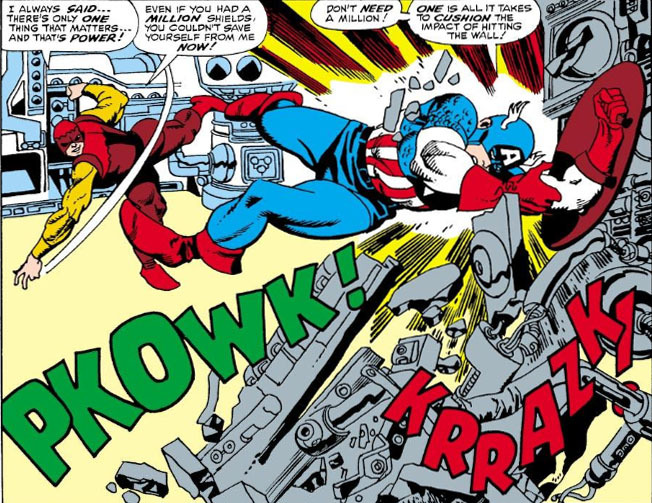 Power Man is dumped for Batroc! while a city's fate hangs in the balance! The power-packed pencils of Jack Kirby! MORE you could ask for?? The Sword and the Spider! With the Mandarin as well as the Avengers looking to settle accounts with the Swordsman (as well as Interpol likely keeping a sharp eye out for him), you'd think that this daring adventurer would be well-practiced in the art of lying low. Instead, he should be more worried about the phrase "word of mouth," as we catch up with him indulging in displaying his talents at a circus--where, if he's hiding, he's certainly doing it in plain sight. He might as well stamp the word WANTED on his playbill, since all of his audiences spreading the word about the performances of "the Swordsman" will practically be pointing law enforcement officers in his direction. The man works at a circus, yet he's startled to encounter "A girl in costume!" 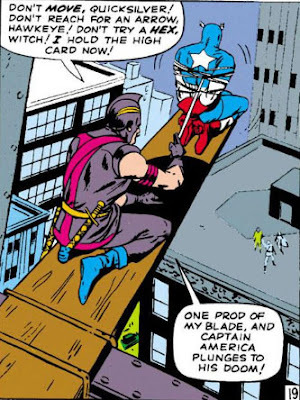 It's a little surprising to see the Swordsman jump at the Widow's offer to strike at the Avengers, given the circumstances of his departure from the team. True, he left under duress--but his rejection by the team was mostly due to a misunderstanding (through his own fault), nor did the story leave the impression that he carried any sort of grudge against them. It was to be expected that he would want to stay clear of them--but eager to stage an attack against them? It doesn't quite follow. Regardless, the Widow moves ahead with her plan. 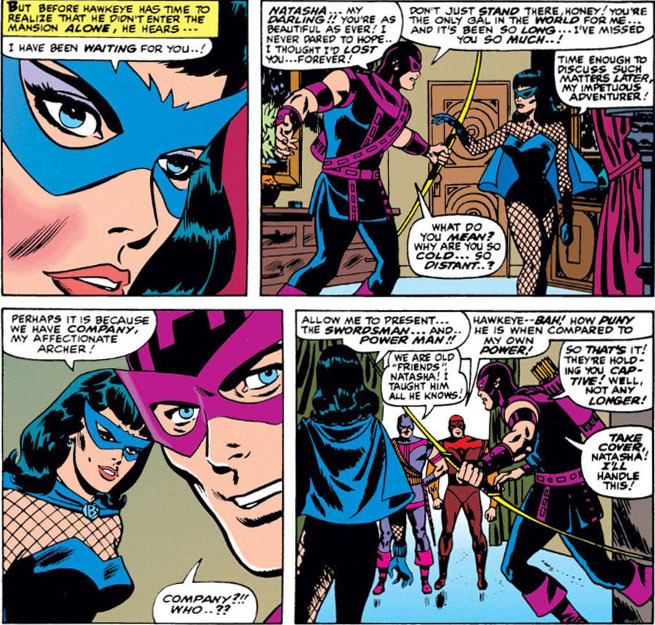 And when she lures Hawkeye to her residence, he discovers not only that she's in league with the Swordsman, but that she's added another powerful Avengers enemy to her team. 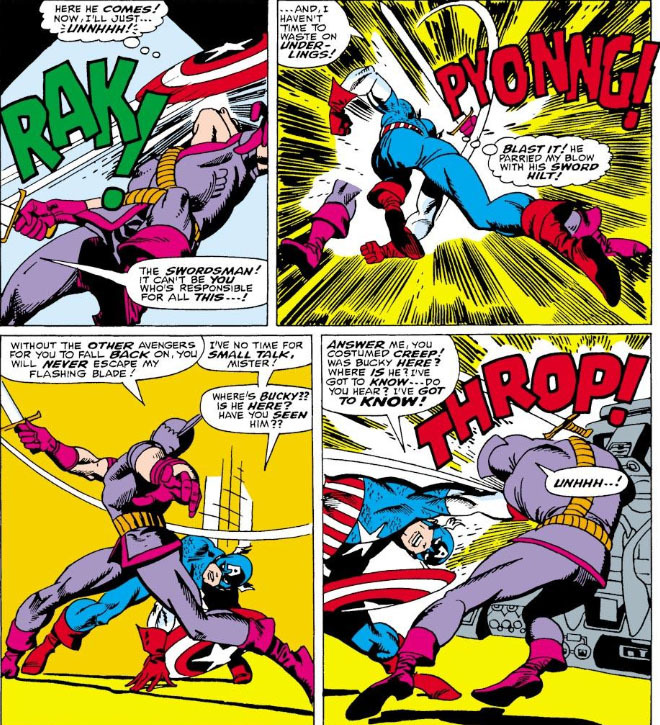 The startling scene comes at the end of Avengers #19, following a heated battle between the Swordsman and Captain America which resulted in the shield-slinger's defeat. The three remaining Avengers are now seemingly faced with an impossible situation, if an improbable one. The Swordsman isn't asking for ransom to win Cap's release, or the theft of some rare artifact, or government secrets--he's demanding Avengers membership for himself, a condition which seems outrageous given the amount of trouble that he's put himself through to secure it as well as his reasons for wanting it. It's also an odd condition for writer Stan Lee to hinge a cliffhanger on, since it's easy enough for the Avengers to circumvent once Cap is rescued. But as we saw in Part 1, Lee has made a number of interesting choices with this character, and he's not through yet. 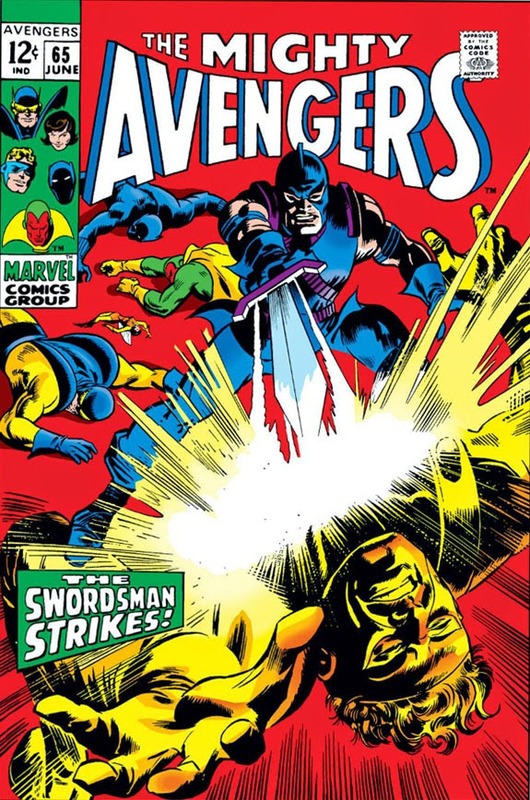 As for the problem at hand, the issue's dramatic cover gives us the impression that the Avengers have given the Swordsman an answer he isn't at all pleased with. 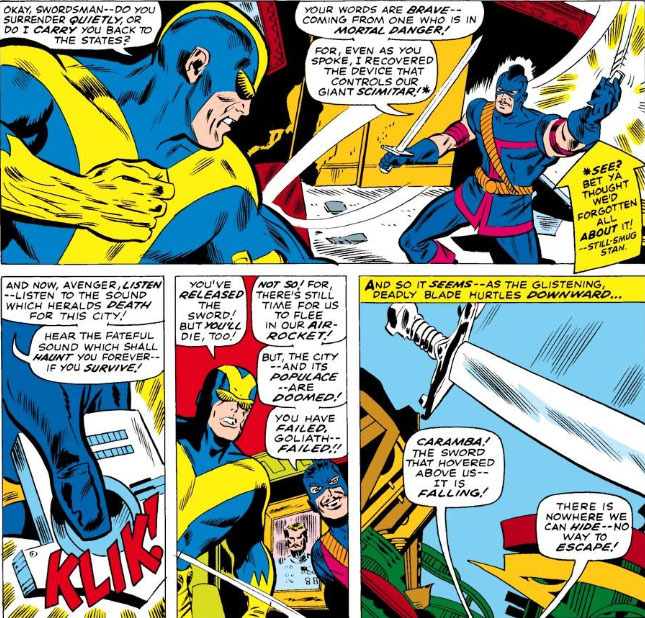 Quicksilver, Hawkeye, and the Scarlet Witch have recently been bickering about which of them would make a better team leader; thanks to the Swordsman, it looks like one of them may be getting a crack at it sooner than they'd imagined. The Coming Of The Swordsman! Welcome to Swordsman Week here at the PPC! Throughout this week we'll take a sharp-edged, long-overdue retrospective look at the man who would become known (if primarily through his own boasting) as "The Best Blade Artist in the World." 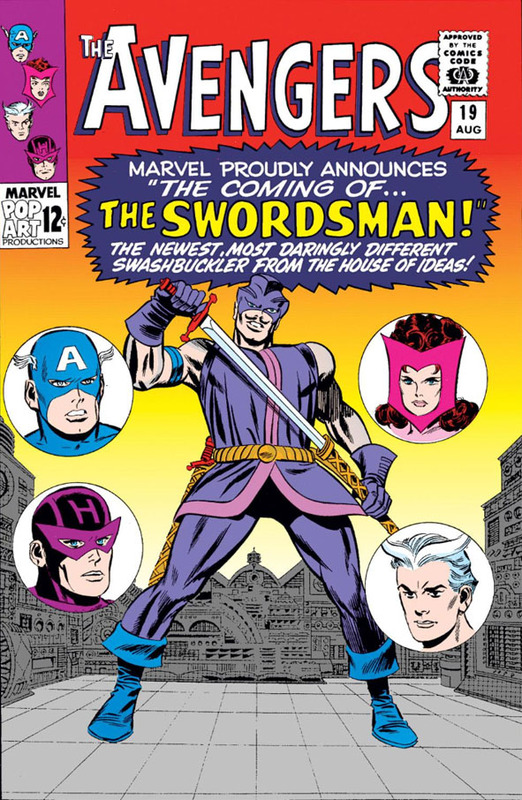 Of all the characters that Stan Lee breathed life into, the Swordsman remains in the top five of the characters I'd most like to get Lee's thoughts on in terms of how the character came to mind for him and why the Swordsman's development was so exhaustive. Unlike many of Lee's antagonists who were given little more than the basics as far as a backstory and motivations, the Swordsman came with a well-thought-out profile and received a virtual showcase appearance in The Avengers that made one wonder if there wasn't a series of his own in store for him. He'd been an adventurer for some time, as well as persona non grata in several countries; he'd had a past with the man who would later become Hawkeye, whom he'd taken on as his protégé in their old carnival days; his self-confidence in his abilities as an opponent mixed with his arrogance; and, in what might have been his ultimate moment of daring, he made a play for Avengers membership. All of this, and more, from a man whose only weapon of both offense and defense was a sword and his skill with using it. 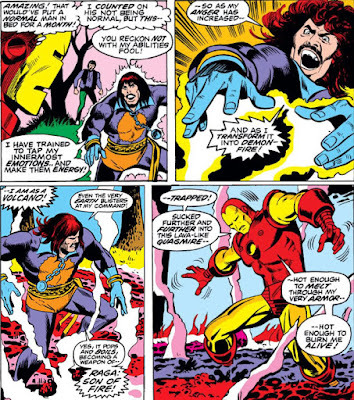 But, why would this man--someone on the wrong side of the law and not regretting that choice--burst onto the comics scene by petitioning to become an Avenger? The answer may surprise you. 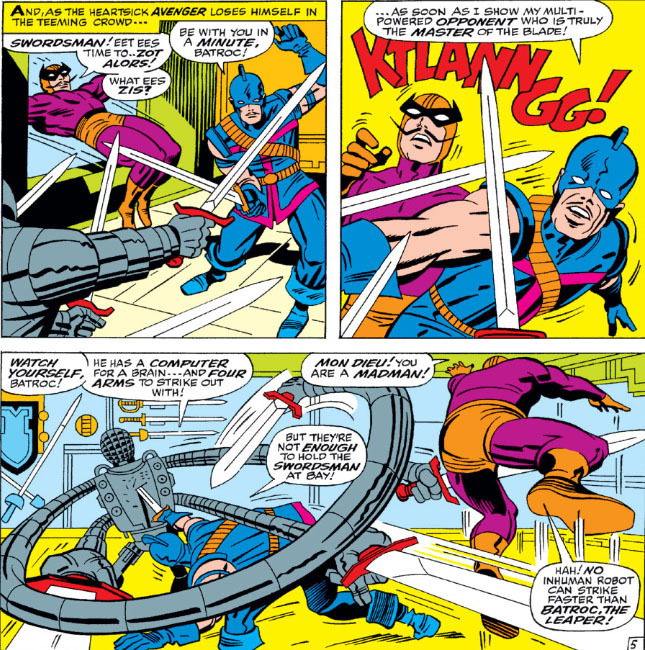 In his two-part introductory tale in the pages of The Avengers, the Swordsman makes quite an impression on the reader; and, just two issues into a shake-up of the Avengers roster which completely changed the team's makeup into a core membership which emphasized teamwork over sheer power, the Swordsman managed to impress this nascent Avengers team, as well. 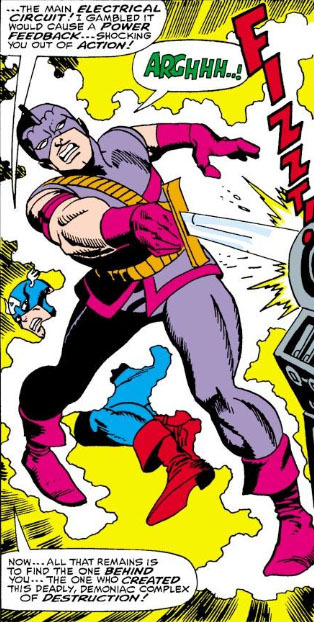 With his own skill and guile, the Swordsman not only managed to hold the Avengers at bay, but also made them battle for every inch of ground they wished to gain against him. The Swordsman, it would appear, was no afterthought of Lee's, but rather a character who would turn out to be one the Avengers' most classic foes. This wouldn't be the Swordsman's baptism of fire, by a long shot--but it would arguably turn out to be that of the Avengers. And give this man credit: Even on the issue's cover, he seems to be fighting for top billing. 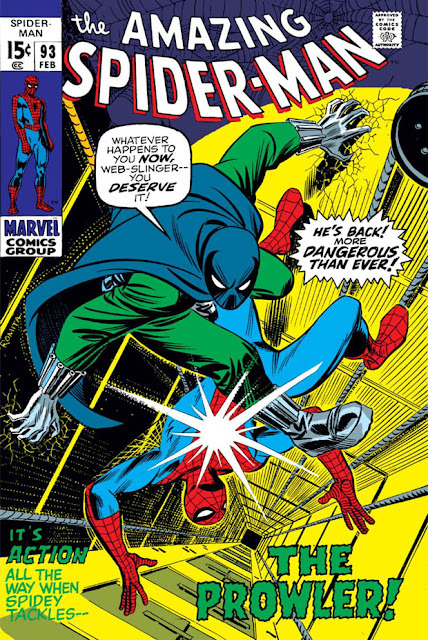 While it's true that Spider-Man and Hobie Brown didn't quite part as friends following Hobie's misguided decisions while acting as the Prowler, they parted amicably, with Hobie even owing Spidey a debt of gratitude after the web-spinner let him off the hook and gave him a second chance to turn his life around. Yet, judging by the cover of the issue which dealt with their next meeting, taking place shortly after the death of Gwen Stacy's father, retired police Capt. 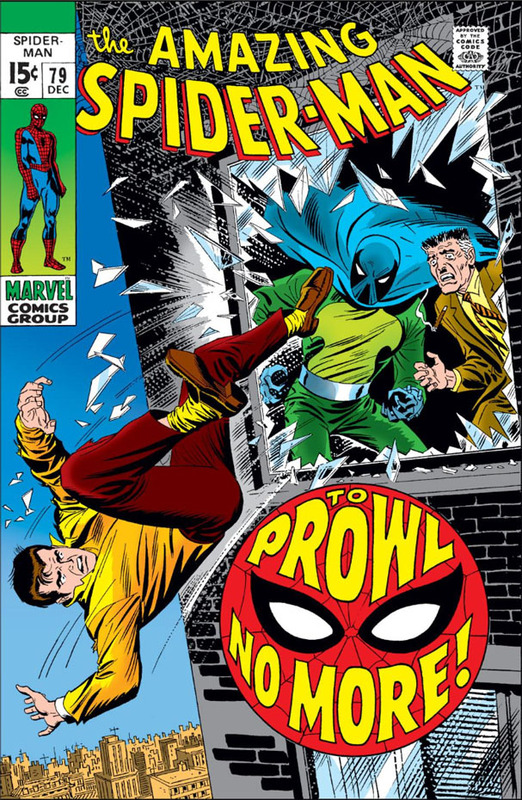 George Stacy, it appears that Hobie isn't yet done suiting up as the Prowler--and once again, he and Spider-Man will come to blows. But, under what circumstances would Hobie reassume the garb and the mission of the Prowler, a one-time disguise that was originally only meant to win Hobie false praise and more promising job offers? Has Hobie's resolve to better his life on his own terms wavered? And how does Spider-Man fit in? In this comparison between the cover of Amazing Spider-Man #79 and its reprint in the pages of Marvel Tales, you don't exactly have to have 20/20 vision to realize what the chief difference is between the two covers. 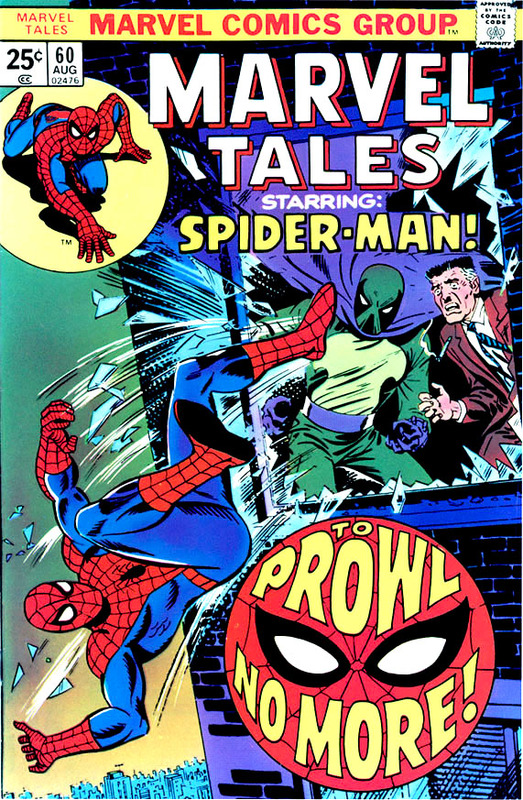 It would appear that, in the 4½ years since this story featuring the Prowler was first published, Peter Parker can no longer be depended on to sell a Spider-Man story, even with clear indications that Spider-Man will be found in its pages. Or, put another way: It was once a given that comic book readers would buy a Spider-Man book, however its cover was conceptualized; but in 1974, it looks like things had to be made a little more clear as far as the book's hero grabbing you directly from the cover. Otherwise, the choices made on the MT cover don't really ruffle any feathers. Sizing has been adjusted to accommodate the addition of the Marvel banner and the extra wording of Spider-Man's billing. 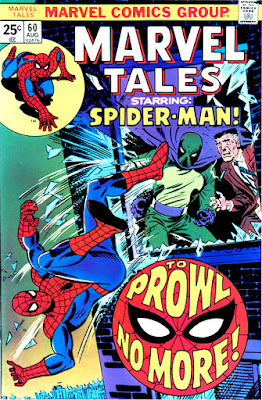 The window image of the Prowler and Jonah Jameson has been reduced--while Spider-Man is larger, presumably to draw more of the reader's attention. The broken glass has also been removed from most of the top of the window frame (with the Prowler's cape extended to fill the space), perhaps to prevent the glass shards from blending with the lettering of the masthead. 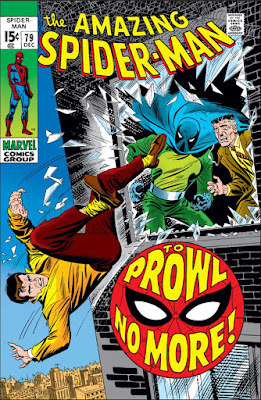 Color revisions have also been made in several areas, most noticeably in the clothing of both Jameson and the Prowler. (Good lord, even Jameson's cigar couldn't escape a new hue!) And it appears that the larger figure of Spidey necessitated the removal of some of the cityscape. We get our first look at the power Raga has learned to harness from within himself as he begins training his followers in the Black Lama's methods in the Santa Monica mountains. When one of his cultists, a girl named Cynthia, breaks ranks and decides to have a fling with a forest ranger, Raga becomes incensed--which is precisely how he becomes a threat beyond the lunatic he already appears to be. Raga then goes on to set the forest ablaze, and the fire quickly spreads to engulf a much larger area in the mountains. 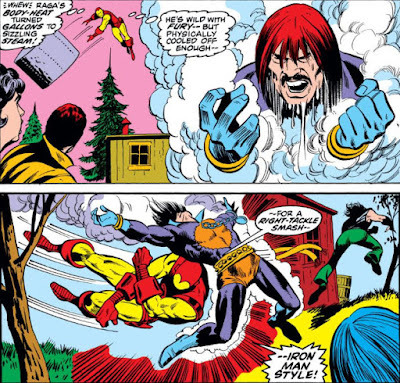 That draws the attention of Iron Man (on vacation in California as Tony Stark), who finds and rescues our injured forest ranger and then deals with the outbreak of fire. It doesn't take him long to then locate the source of all the trouble, and just in time. 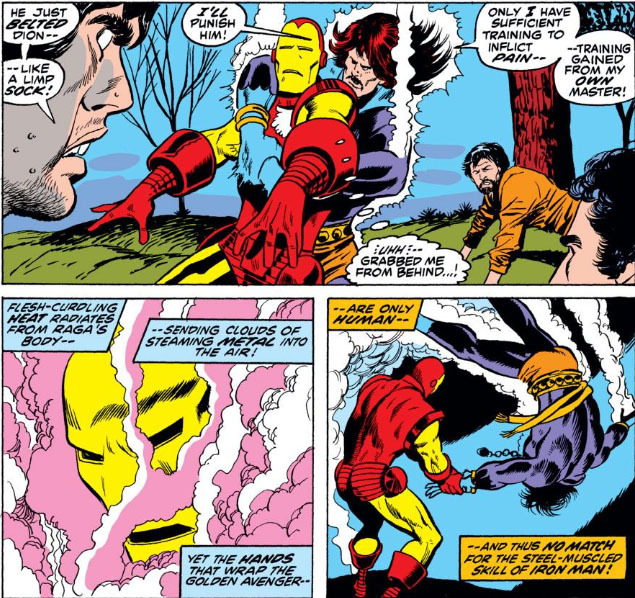 Fortunately, Iron Man's armor is now solar-powered, which gives him some measure of protection against heat-related threats. Still, it's clear that Raga is a threat to be taken seriously, and, if possible, from a distance. Raga's sudden spike in power now has Iron Man facing off against a virtual living volcano--assuming he survives this cliffhanger to battle on in Part 2! The Last Days Of Sue Storm!